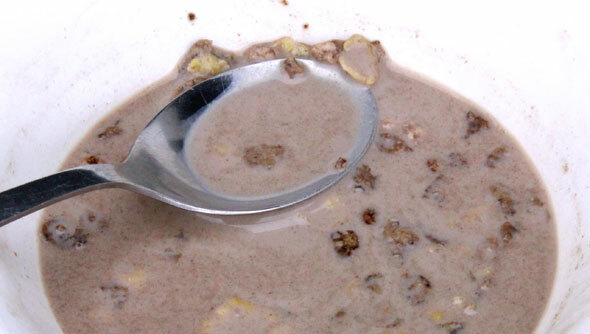 Finally... a chocolate cereal that's actually chocolatey! 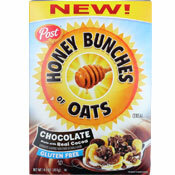 Honey Bunches of Oats Chocolate is a nice new addition to the huge Honey Bunches of Oats family. Post's website currently lists 14 active Honey Bunches of Oats cereals. Many of those cereals taste somewhat similar. This new one stands alone. It's one of the most chocolatey chocolate cereals I've ever had... and I've been reviewing cereals professionally for nearly 15 years. 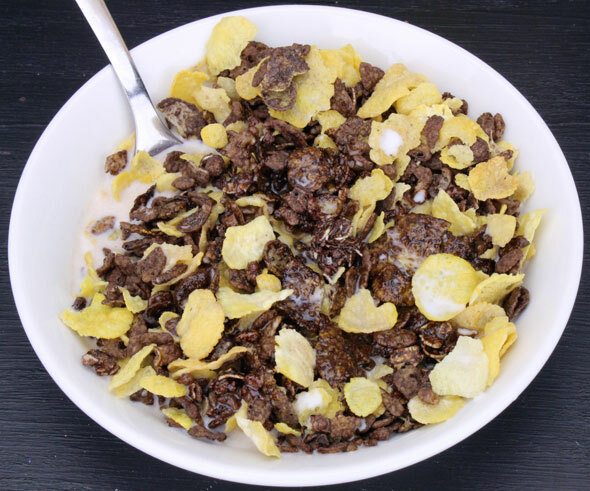 The cereal consists of cocoa-coated corn flakes, regular corn flakes, cocoa rice crisps and cocoa-coated oat clusters. Pairing the cocoa elements with traditional corn flakes was a good idea. It gives the chocolate something to play off of, which then seems to only intensify the sensation of chocolate. Some might consider this version of Honey Bunches of Oats to be a little short on bunches of oats. There's not as many oat clusters per spoonful as the image on the box would indicate. I actually found that to be a good thing. 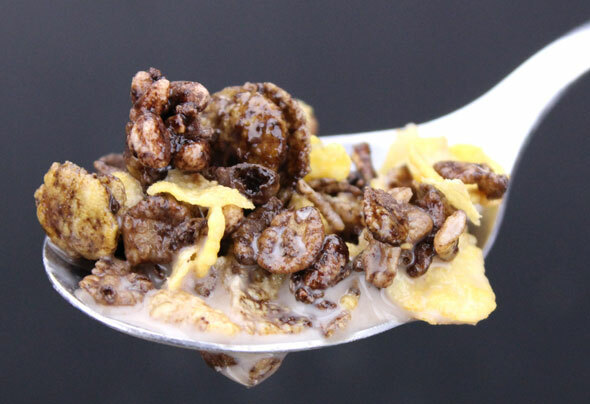 You get a small oat cluster crunch in every other bite, which helps keep the texture of the cereal interesting until the end of the bowl. The milk left over at the end of a bowl is amazing. It's chocolate milk that you could siphon off and sell as commercial grade chocolate milk. If you were a kid in the 70's, get ready to have flashbacks of Cocoa Krispies and Cocoa Pebbles in their prime. Honey Bunches of Oats Chocolate retains a mild crunch for about 5 minutes when doused with milk. If you listen closely to your bowl, you can hear the crispy rice giving off a little snap and crackle... just short of a pop. In a world of chocolate cereals that taste like faux chocolate carob... In a land where once tasty chocolate cereals have been ruined by politically correct ingredient changes... a new hero emerges! 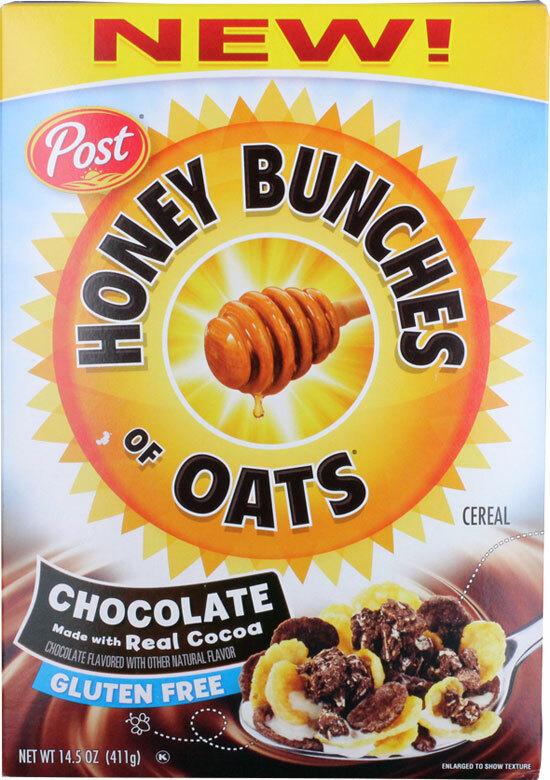 If you like chocolate, I recommend your try Honey Bunches of Oats Chocolate cereal. Nutritional Considerations: Each 3/4 cup serving of Honey Bunches of Oats Chocolate (with fat free milk) has 170 calories, 1.5 grams total fat (0 grams saturated and 0 grams trans), 0mg cholesterol, 160mg sodium, 27 grams total carbs, 1 gram dietary fiber, 8 grams sugar and 2 grams protein. The $0.00 price shown below indicates that the company provided us with a sample of the product. What do you think of Honey Bunches of Oats Chocolate? 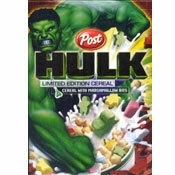 How can we get POST to bring back this cereal! No warning it was just gone from the shelves! HELP! One of the best cereals available. This cereal is probably the best chocolate cereal on the market! 5 out of 5 stars! I thought this cereal was gonna have a chocolate chip here and there but Wow! The different types of grains and flakes covered in chocolate just blew me away! I had two bowls :) Oh, and the milk afterwards is epic. No such thing as too much chocolate, silly person! ;-) This cereal does rock; in flavor, crunch, nutrition, and lack of glutens... it's a knockout. I actually thought it had TOO MUCH CHOCOLATE. Super good. Non-stop chocolate flavor. Winner. I look forward to trying this variety... but if you're looking for really good real chocolate taste, try out the new Special K: Chocolate Almond. It has enough actual chocolate to not have to call itself "chocolatey." Trust me on this one. Tastes so good. Bought it Sunday. Almost gone on Tuesday. Gotta get more. Agreed! Great cereal. Also helps that it was just $1.69 a box if you bought 2 boxes at Ralph's this weekend. Good price. Good taste.